The uproar over the surveillance practices of the National Security Agency has taken center stage in Washington, but for the majority of internet users, advertisers are more feared than the government, according to a new survey from the Pew Research Center. Almost 9 in 10 internet users, or 86 percent of Pew survey respondents, report having taken steps to wipe away or hide their digital whereabouts. Practices include everything from clearing one's browser history to using a public computer to be able to browse anonymously. And 55 percent of survey respondents have taken actions those actions to clear their internet history to avoid specific people, organizations or the government, the report says. Unsurprisingly, internet users say their top threat online is hackers and criminals. Their second most avoided foe are advertisers, with 28 percent of survey respondents saying they have attempted to hide from advertisers online. Nineteen percent of users said they wanted to avoid people from their past and specific friends. 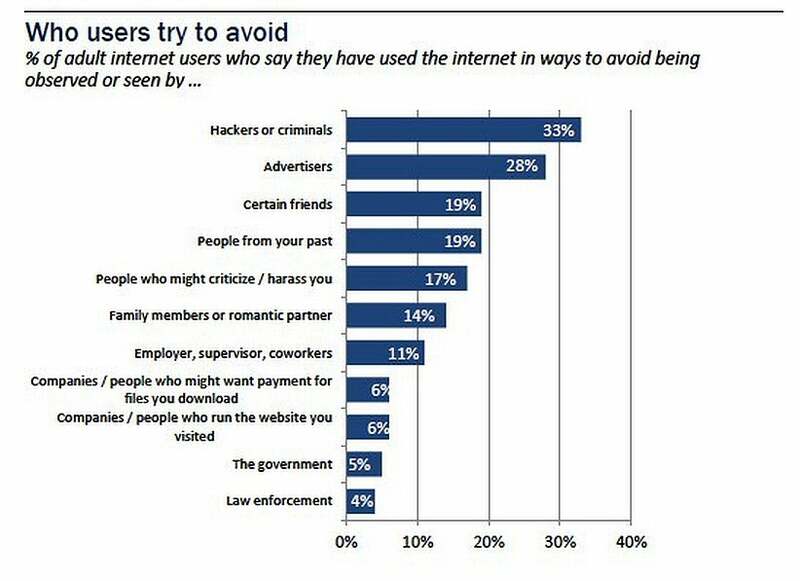 Meanwhile, only 5 percent of respondents attribute their attempts to be covert on the internet to avoiding the government. Even as they take steps to cover their digital tracks, however, many internet users know that in this age of hacking, nothing is really ever gone. The survey from Washington, D.C.-based Pew Research Center included responses from 792 internet users, all of whom were surveyed between July 11 and 14 on the telephone by the Princeton Survey Research Associates.